BPGA President Lt Col Khandaker Abdul Wahed (retd), third left, and City Bank Deputy Managing Director and Wholesale Banking and Micro Finance Head Sheikh Mohammad Maroof along with other officials and organisers are seen during a press conference. 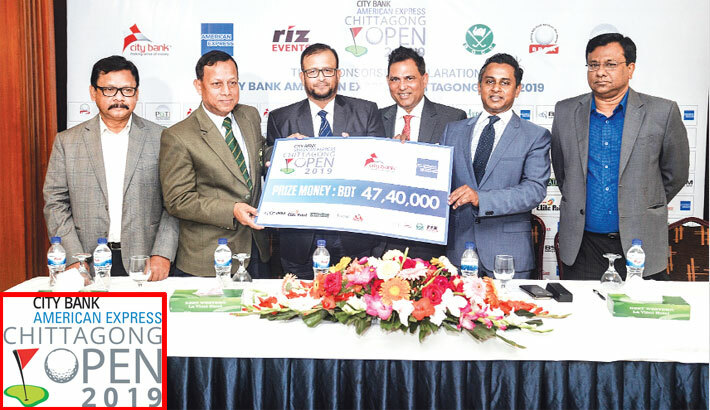 The 3rd “City Bank American Express Chittagong Open-2019”, an international golf tournament which will commence from March 6 and will conclude on March 9 and will be held at Bhatiary Golf & Country Club (BGCC) in Chittagong. The tournament is co-sanctioned by Professional Golf Tour India (PGTI) and Bangladesh Professional Golf Association (BPGA) and approved by Bangladesh Golf Federation (BGF). This is for the 3rd time that an international golf tournament is being organised at BGCC. The prize money for the four-day tournament is Taka 47,40,000. A total of 126 golfers from home and abroad will take part in this professional tournament. City Bank American Express is the title sponsor of the tournament and it is co-sponsored by BSRM and Elite Paints. The other partners of the tournament are Ispahani, Polar Ice Cream and The Avenue Hotel & Suites. A press conference in this regard was held recently in the capital. City Bank Deputy Managing Director and Wholesale Banking & Micro Finance Head Sheikh Mohammad Maroof, BPGA President Lt Col Khandaker Abdul Wahed (retd) and Riz Events Chairman Rizwan Bin Farouq were present at the press conference.